Gain specialist knowledge in pure and/or applied mathematics. You’ll be prepared for a variety of technical and non-specialised careers. Mathematics underlies all the physical sciences and is increasingly involved in biological sciences, social sciences and management. It is needed to make quantitative predictions from scientific theories. You’ll specialise in pure and/or applied mathematics whilst having the option to study units in statistics, computing, physics, and economics. As with all of our mathematics courses you will have the option to switch after the first year, so you can keep your options open when you apply. You’ll develop the specialist skills and knowledge for a technical career as well as receiving good training in analytical thinking. This combination of skills and knowledge means you will also be well-suited to non-specialist careers such as computing, financial services and management. 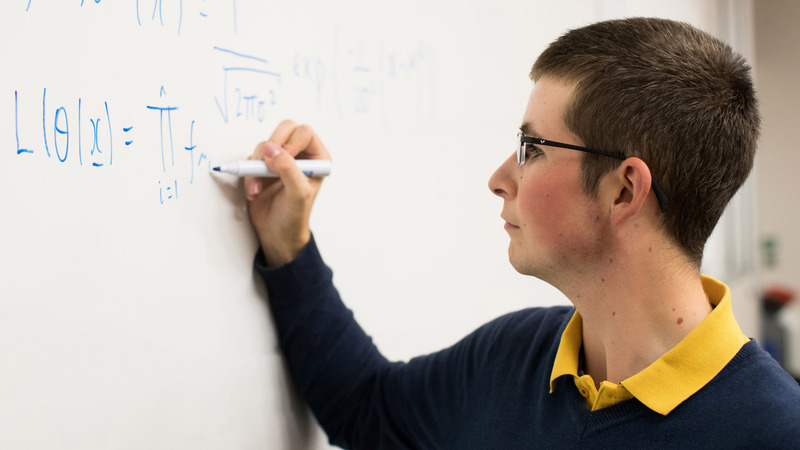 There are lots of reasons to study mathematics at Bath. Read our top 5. The Master of Mathematics (MMath) course provides you with the same core skills and knowledge of the Bachelor’s but with a greater exposure to research. You’ll study masters level units and a two-semester research project, preparing you for postgraduate study or a career in academic or industrial research. You’ll learn from academics with expertise in different areas of mathematical sciences, including algebra and geometry, analysis, applied and interdisciplinary mathematics, numerical analysis and scientific computing, statistics and probability. Their international collaborations and research activities feed into undergraduate teaching and contribute to your learning experience. You’ll be able to access our Maths and Statistics Help (MASH) centre to get help with revision, tests and coursework. A final-year option provides the opportunity to use our high-performance computing facility ‘Balena’, which can perform over 110 trillion calculations a second. You’ll also be supported during your studies by regular small group tutorials and one-to-one meetings with a Personal Tutor. 92% of mathematical sciences students agreed they were able to contact staff when they needed to (National Student Survey 2017). You’ll be able to go into a wide variety of careers including teaching, in the finance sector as an accountant, actuary or analyst, or as a statistician in government. You’ll also be well suited to roles developing software in commerce or the technology sector. Recent employers include Aviva, British Telecom, Deloitte, EY, PwC and Tate & Lyle. Many of our graduates also choose to go on to postgraduate study in preparation for academic or industry-based research careers Find out more about what our graduates go on to do. You'll be able to choose from a number of optional units in years 2 and 4. Here are some examples of the units our students are currently studying. Broaden your horizons with a year studying at a university abroad. You’ll experience another culture whilst studying a course that complements your studies at Bath. We have links with universities in the United States, Canada, Australia, New Zealand, Singapore, South Africa and Europe. This includes Binghamton University, National University Singapore, University of Canterbury, Stellenbosch University and the University of Helsinki. Read more about the year abroad opportunities. Your application, especially your personal statement, should demonstrate your enthusiasm for studying mathematics. This might include relevant reading, voluntary or work experience, topics within mathematics that particularly interest you or other relevant extra-curricular and co-curricular activities. Strong performance in Mathematics is essential, both in your entry qualifications and any previous study. We also recommend you consider taking a STEP exam , as this can provide excellent preparation for studying university level Mathematics. If you are taking both Mathematics and Further Mathematics at A level any offer will include an alternative condition that includes a STEP grade (or the GCE Advanced Extension Award). Depending on your qualifications STEP may be entirely optional (for example, if you take the International Baccalaureate Diploma) or compulsory (for example, APs). We do not currently consider performance in the MAT or TMUA when making admissions decisions. A*A in Mathematics and Further Mathematics plus either A in a third A level or B in a third A level plus grade 2 in any STEP or Merit in the GCE AEA in Mathematics. If you are studying A levels we strongly prefer that you take a full A level in Further Mathematics. Alternative offers are available if you have only studied Further Mathematics at AS level or have not studied it at all. If you are taking a GCE A level in a science subject, you will need to pass any separate science practical endorsement. 36 points overall and 7, 6, 6 in three Higher Level subjects including 6 in Mathematics or 7, 6, 5 in three Higher Level subjects including 7 in Mathematics. Unfortunately BTEC Level 3 Extended Diplomas (QCF)/ BTEC Level 3 National Extended Diploma (RQF) are not a suitable route for this course. D2, D3 in Mathematics and Further Mathematics plus either D3 in a third principal subject or M1 in a third principal subject plus grade 2 in any STEP or Merit in the GCE AEA in Mathematics. AA in two Advanced Highers including Mathematics plus AAAAA in five Scottish Highers. Unfortunately, the Access to HE Diploma is not a suitable route for this course. We can consider combinations of accepted qualifications, such as A levels and a BTEC. We may be able to consider combinations of qualifications that include only an AS level in Further Mathematics or without Further Mathematics. You will likely be required to obtain a grade 2 in any STEP or Merit in the GCE AEA in Mathematics. Please contact us at admissions@bath.ac.uk to discuss your profile. We can also consider combinations that are not listed and that do not include A levels. You should read the information about essential and preferred subjects and subject combinations. We cannot consider different qualifications in the same subject area. GCSE English grade C or 4 (or equivalent from category C). AAA in three subjects including Mathematics plus grade 2 in any STEP. We do not accept General Studies as one of these three subjects. We do not accept grade A- in place of grade A. Pass the relevant certificate with an ATAR or TER of 97 with grade A or 85 in Mathematics and Physics plus grade 2 in any STEP. Overall Band Position of 1 with HA in Mathematics and Physics plus grade 2 in any STEP. Level 3 Diploma achieved with Excellence including Level 3 Mathematics with 18 credits at Excellence (E) and two Level 3 subjects with 14 credits at Excellence (E) plus grade 2 in any STEP. an average of 90% in the Diploma with 90%, 88%, 88% in three Year 12 subjects including Advanced Functions and Calculus & Vectors plus grade 2 in any STEP. 5.7 overall with 6.0 in the Mathematics state matriculation exam plus grade 2 in any STEP. An overall score of 95% in the scientific pathway with 10, 9, 9 in three subjects from your final report card including 10 in Mathematics plus grade 2 in any STEP. 9.0 overall with 9.5, 9.0, 9.0 in three subjects including 9.5 in Mathematics plus grade 2 in any STEP. 90, 85, 85 in three extended subjects including 90 in Mathematics plus grade 2 in any STEP. 9.0 overall with 95, 90, 90 in three state exams including 95 in Mathematics plus grade 2 in any STEP. 5 in all subjects with 85% in Higher Mathematics and 80% in a second Higher subject plus grade 2 in any STEP. H1, H1, H1, H2, H2, H3 in 6 Irish Leaving Certificates with H1 in Mathematics plus grade 2 in any STEP. 16 overall with 17 in Mathematics plus grade 2 in any STEP. 15 overall with 17 in Mathematics plus grade 2 in any STEP. 85% overall with 9.0 in Mathematics plus either 9.0 in Advanced Mathematics or grade 2 in any STEP. Average of 85% across 4 subjects with 90% in Mathematics. 5, 5, 5 in 3 APs including Calculus BC plus grade 2 in any STEP. We cannot consider Calculus AB as one of these 3 subjects. You will also need to pass your High School Diploma and achieve an ACT score of 30 or SATR scores of 740 in both Mathematics and Evidence based Reading and Writing. 1.3 overall with 14 in Mathematics in your final examinations plus grade 2 in any STEP. Mathematics must be studied as an intensive course (erhoehtes Anforderungsniveauor Leistungskurz), where applicable. A score of 9 overall with 9 in Mathematics plus grade 2 in any STEP. 19 in the Apolytirion with 19 in Advanced Mathematics plus grade 2 in any STEP. 19 in the Apolytirion with 19 in Maths plus A* in A level Mathematics and A in Further Mathematics. We strongly prefer applicants who have studied A level Further Mathematics. You may also be considered if you have only studied Mathematics, and the typical offer is: 19 in the Apolytirion with 19 in Mathematics plus A* in A level Mathematics and A in a second A level plus 2 in any STEP. 19 in the Apolytirion with 19 in Mathematics plus A* in A level Mathematics and A in a second A level plus 2 in any STEP. CGPA of 85% with 85% in Mathematics from the final year plus grade 2 in any STEP. AAA in 3 H2 subjects including A in Mathematics plus either A in a H3 mathematics subject or grade 2 in any STEP. We are unable to consider a Polytechnic Diploma for our Mathematics degrees. Register for updates about 2019 courses.